Configure all the main functions on-the-fly. Strike Pro Spectra allows you to easily access the keyboard main controls; Multimedia keys, G-mode, lighting values and macros. 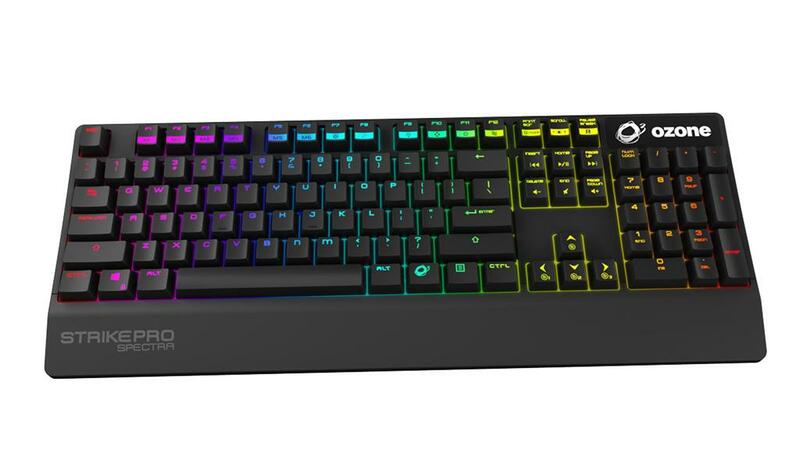 Ozone has renewed Strike series upgrading Strike Pro mechanical keyboard with RGB functions to fulfill the needs of the actual gamers and make it totally customizable; 16,8 million colors, 7 different lighting effects and color map profiles. Mark and map your keys with different colors to keep track of your commands, spells, weapons or shortcuts and create a spectacular environment in your gaming sessions. Experience maximum availability and immediacy thanks to the keyboards built in HUB & Audio inputs. Fast and reliable, Cherry MX is the most wanted switch amongst gamers thanks to its smooth and precise mechanism. Get the most out of your keyboard and easily create your own settings, shortcuts and macros.